Social Innovation Center (HYSIC) hosted ̔Women Seeing Through the End̛ forum in cooperation with Connecting Dots (CDOT), a partner company of social innovation organizations in Korea. The forum, held at the International Conference Room located on the sixth floor of the Paiknam Library, ran for a total of four hours and was aimed at helping females who are willing-to-be entrepreneurs. The forum was organized to help such women facing challenges in the start-up market through the forum panelists sharing valuable experiences and advice to those who are interested or have already settled in the field. The forum consisted of three sessions with the first two respectively titled START-UP: Power to Venture and COMMUNITY: I Am Stronger as We, Find a Community. After opening speeches from three HYSIC officers, each session commenced by introducing one moderator and three panelists who gave brief presentations on their personal experiences in the startup market either as CEOs or as employees. After each session, the panelists interacted with the audience by answering questions previously uploaded on Slide.com. The open discussion wrapped up the forum and gave opportunities for everyone to speak about their own opinions by arranging seats into a circle. Although the application period for this forum was relatively short, more than a hundred people visited the forum and participated enthusiastically. 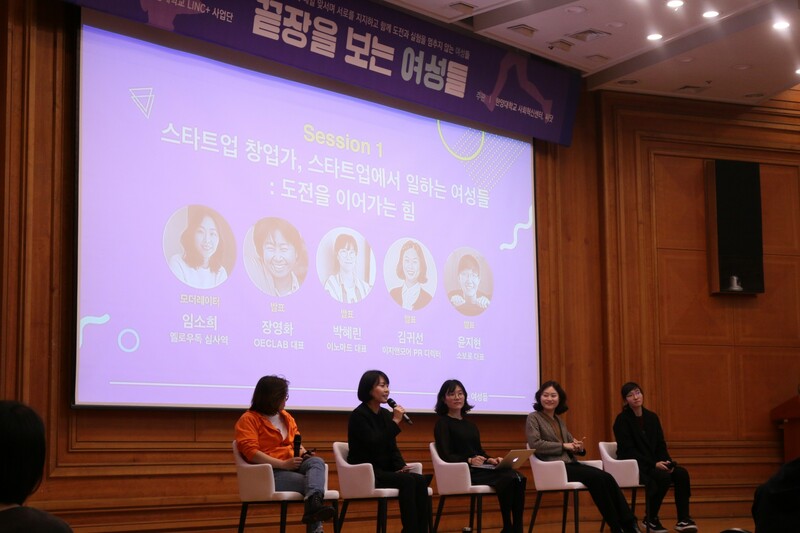 According to Kim Eun-jeong, the Deputy Head of HYSIC, the event was founded by a small number of female students who actualized their dreams of establishing a start-up company by participating in social venture programs. She expressed her delight at the number of people who have visited the forum to share their ideas and hoped to turn this into a regular event. Kim added that there are three important keywords for female entrepreneurs facing challenges in the start-up market. First, network. People with the same issues should collaborate, and in order to do so, it is crucial to maintain a network of peers and instructors. Next, bravery to initiate will help those at crossroads; whether that is to start a business or to start over as an ordinary employee. Third, the self-confidence that her company can sustain, go through obstacles lying ahead. This is also related to resilience, which is a necessary trait to help an entrepreneur spring back to business despite failures.